We were contacted early in April that a bittern was being see at Foxton. I couldn't get away on the friday so Tony Fluerty headed up there with Kath McIndoe to see if they could find it. That night Tony called and said it was the friendliest bittern he had come across. They had managed to get within 15 metres from the bird, and it just happily fed on the marsh. Both he and Kath had got some great images. Needless to say we headed up to the beach the next day. The bittern was coming in at a particular time when the tide was almost full. By the time arrived there was at least 10 keen photographers scanning the marshes. Somebody suddenly saw the bittern fly in and disappeared into the sedges. 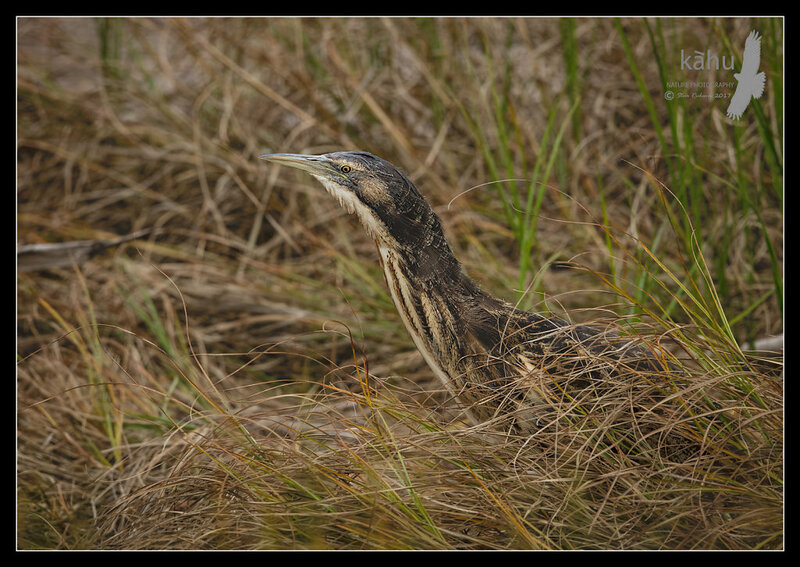 The bittern fed along the marsh and it was amazing how it would disappear for several minutes before suddenly appearing somewhere else. It's camouflage was a marvel to see. 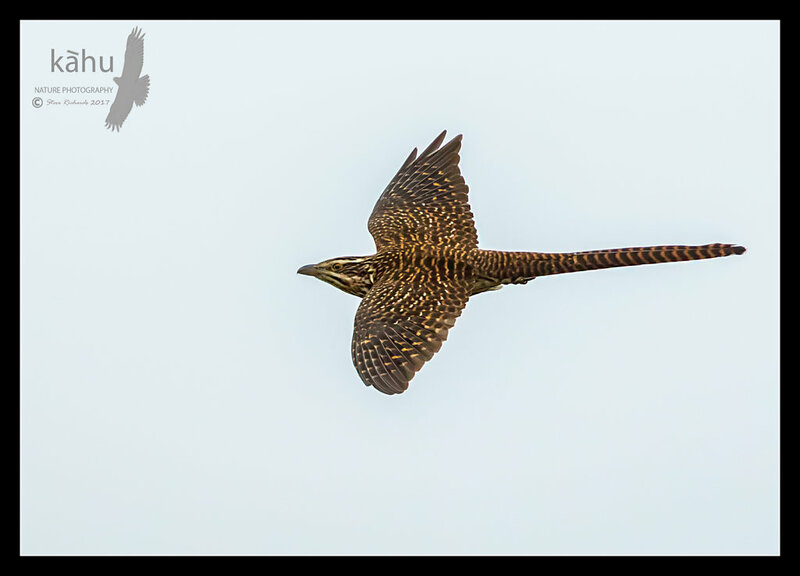 At one point it came quite close and I got some great images, easily the best I have gotten of bitterns. 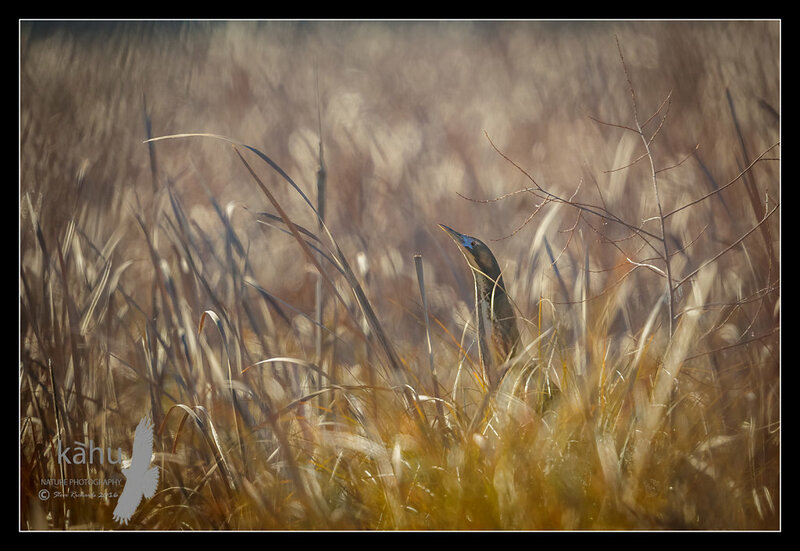 We all spent about an hour photographing the Foxton Bittern, and left when he slowly headed away across the wetland and disappeared. 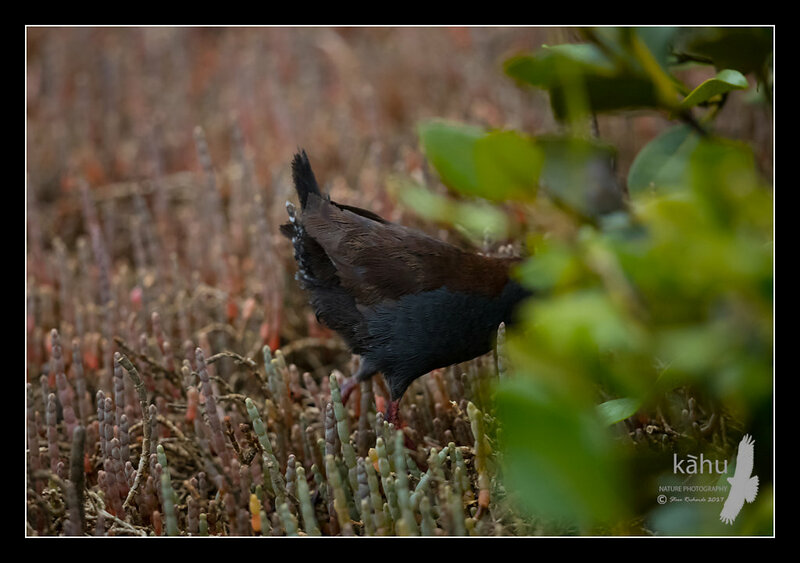 Crakes were still in my sights, so I started looking for new places where I might find these tiny birds. I visited the spot we found some late in 2016, on a regular basis, and once I started to understand the spotless crakes habits, I started to have real success photographing them. I quickly learnt their preferred habitat, so started looking at other areas in a new light. I identified new spots, and heard spotless crakes calling in most, but only a few where suitable for photography. I think spotless crakes are much more abundant than most people realise, they are just so cryptic, and the habitat they live in is so hard to get into, and even harder to photograph the birds. 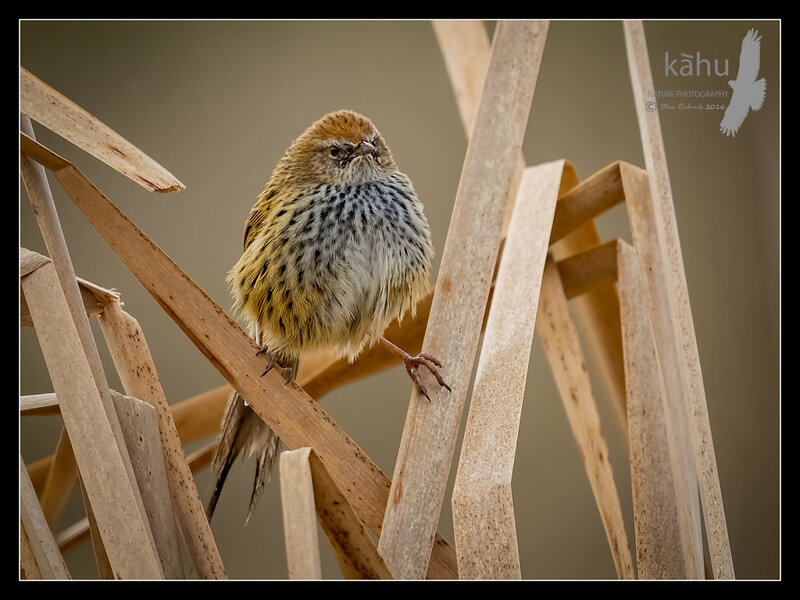 I was fortunate to find one spot where the birds were often within my minimum focus range, which was frustrating. Unfortunately I couldn't more back any further without destroying the vegetation. But I got lots of full frame images, often cutting of their legs. After having my vehicle broken into at Miranda we decided to head back home to get it fixed. Finding Toyota couldn't get new side windows for my Highlander for a couple of weeks, I decided I would fix the windows myself with a couple of sheets of plastic, and head north for some more punishment. Tony and I packed up and headed back up north. 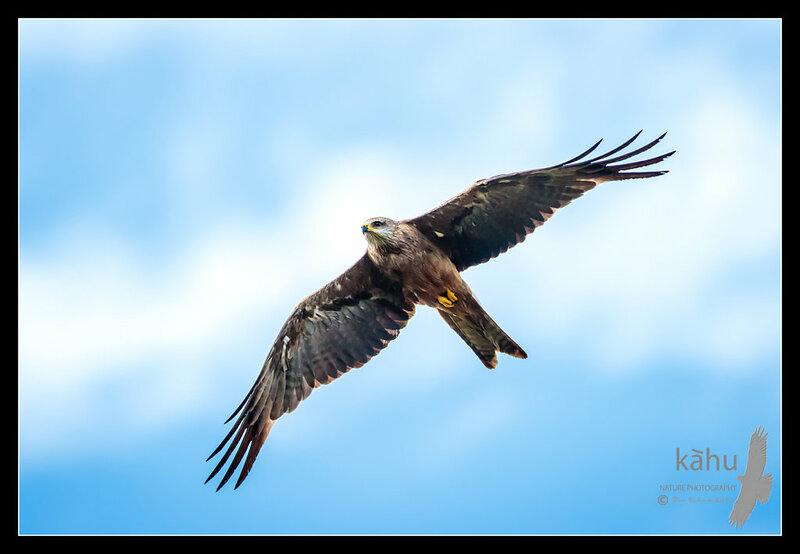 We made a be line for Auckland and went to Huntly on the way to see if we could find the Australian Black Kite, which had appeared there a few months before. Grabbing fish and chips we headed out to the area it had been seen recently. We stopped at the start of the valley to eat them, so I got out to get some tomato sauce. Suddenly Tony is throwing his fish and chips everywhere and jumping out of the car with his camera. 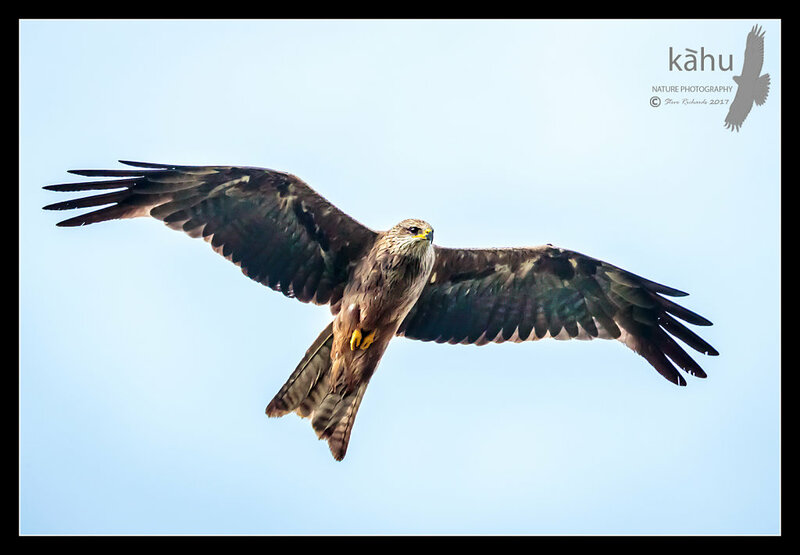 I grabbed my camera and rushed round the back of my 4WD to see the black kite cruising past at about 50 feet above us. 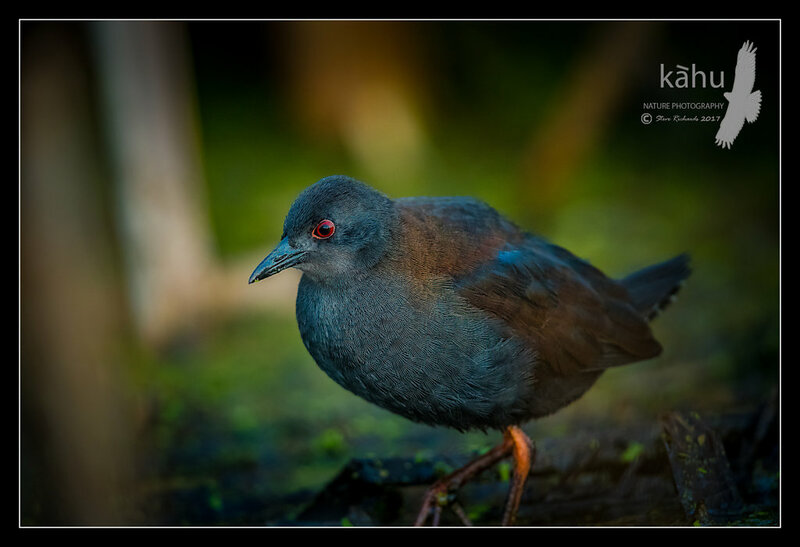 We headed for Shakespear Park again, as while away Donald and Oscar had found some more spotless crakes. We pulled up Donalds drive had lunch then headed over to the spot. It had been named the Crake Arena, and they had seen and photographed several spotless crake at close distances. The pond in the middle was fast disappearing so we only had a couple of days, and managed to get some great close shots, as 3 or 4 crakes would come out onto the mud at regular intervals. We also got more shots of the banded rail, rosellas and kingfishers. We met up Oscar Thomas and along with Donald, visited a few spots further north. 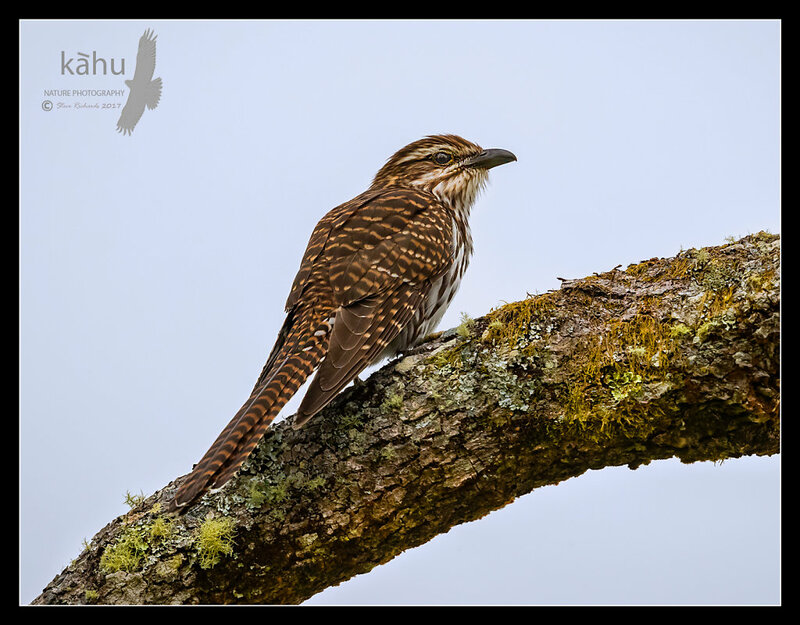 Next morning we headed for Pureora Forest Park, to chase the long tailed cuckoos. In the mornings we were trying to catch up with the Yellow crowned Kakariki, but the misty overcast conditions weren't very conducive. Later we searching for long tailed cuckoos, without a great deal of success. Later one afternoon we found a spot with several cuckoos. 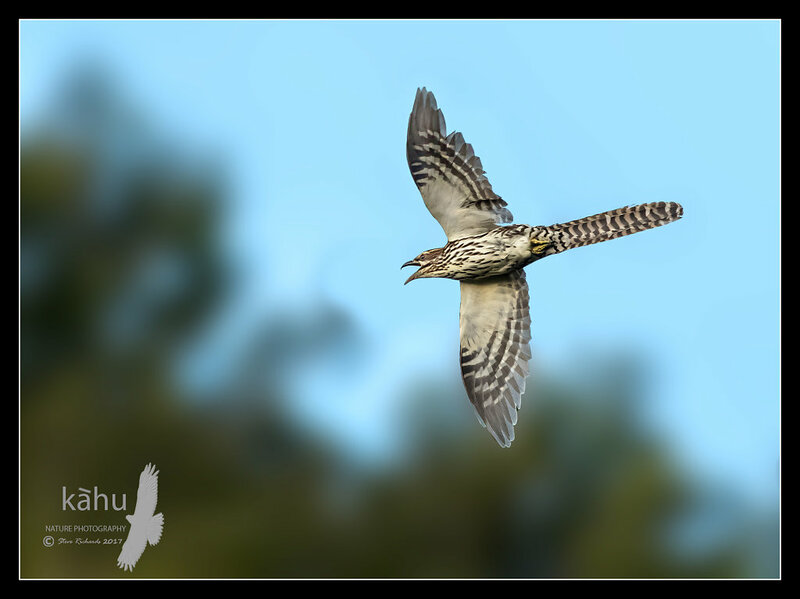 We went back the next morning and had a ball with at least 8 cuckoos in a group of trees. 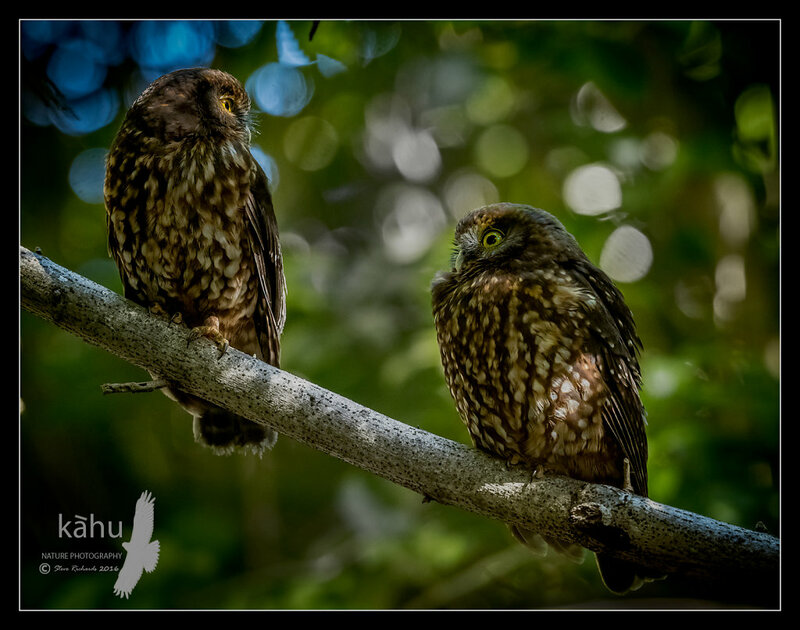 We had run into Mike Ashbee at Donald Snooks home in Auckland, and mentioned we had a spot you could regularly see moreporks during the day time. While in Upper Hutt waiting for the windows in my 4WD to be fixed Mike texted me and we arranged to meet him and Amber at Queen Elizabeth Park. We meet them just after lunch and headed for the area the moreporks were roosting. Mike photographed a couple of dab chicks on the way. We ran into Roger Smith who had originally found the moreporks and Gavin Klee, a local photographer who were on their way out. We located a pair of birds and set about to take dozens of photos. The female fluffed itself up and and put on quite a performance. It was a very enjoyable afternoon with Mike and Amber. Spotless crakes and Marsh crakes have long been my nemesis since I had started taking bird photography seriously. 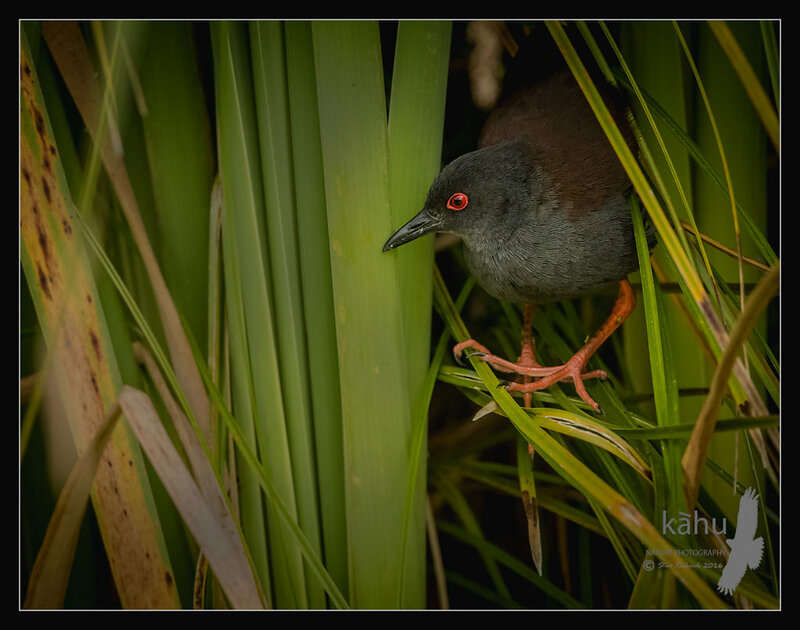 I had seen my first spotless crake at Tokaanu with Tony a few years ago. Even though we had tried plenty spots since we had heard them, my only other encounter was a fleeting shadow at Boggy pond. We had put in several trips over the latter months of 2016 without a lot of success. I was determined to find some so we planned a Xmas trip after both crakes and banded rail, another bird which I had eluded me. In early December we decided to check out a few spots, as it was their breeding season, so hopefully we might hear them calling. We managed to hear quite a few spotless crakes calling, and even managed a few photos of spotless crakes, but they were always just too far away. Tony and I were leaving on about the 22nd and the weekend before I saw a report on Bird.net that some crakes, both marsh and spotless had been seen at the Ahuriri Estuary, near Napier. We quickly changed plans and headed for Napier. The local camping ground was handy to the wetlands, only a few minutes drive away. 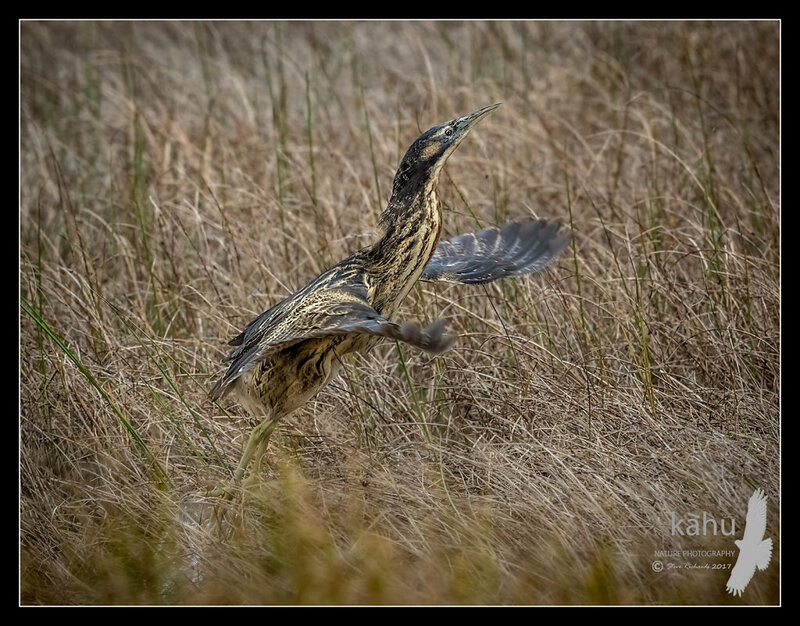 On our first visit to the wetland, we met a Napier couple who were already watching some birds and soon we were busy photographing our first Marsh Crakes. The lighting wasn't ideal but we were quickly on the board with some OK images. 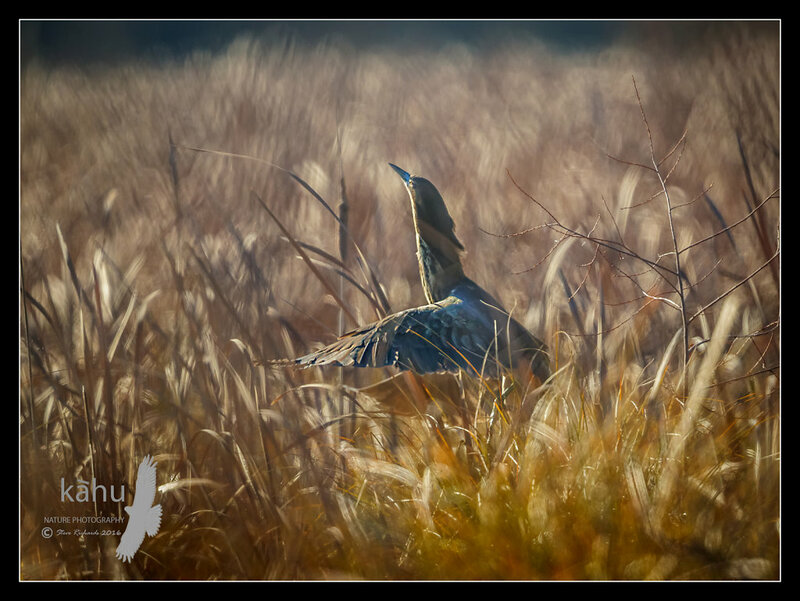 Over the next few days we would get superb images of both marsh and spotted crakes amongst the sedges, meeting a few of the locals including Tim Rumble who were there to photograph the birds. Our next target was banded rail so it was off to Shakespear Park north of Auckland. Tony had met Donald Snook on the internet, and he said he would show us around the park, and also said we were welcome to stay at his home, which overlooks Shakespear Park. Donald drove us around the park at 6am the next morning and we quickly spotted banded rail scuttling amongst the low vegetation. We also saw a variety of other birds including brown quail and NZ dotterel. Now we had the lay of the land we put in a determined effort to photograph the elusive rails. That evening I decided I would sit at a likely looking spot where I had seen a rail earlier. I was hunkered down, and I thought I kept hearing a spotless crake calling. 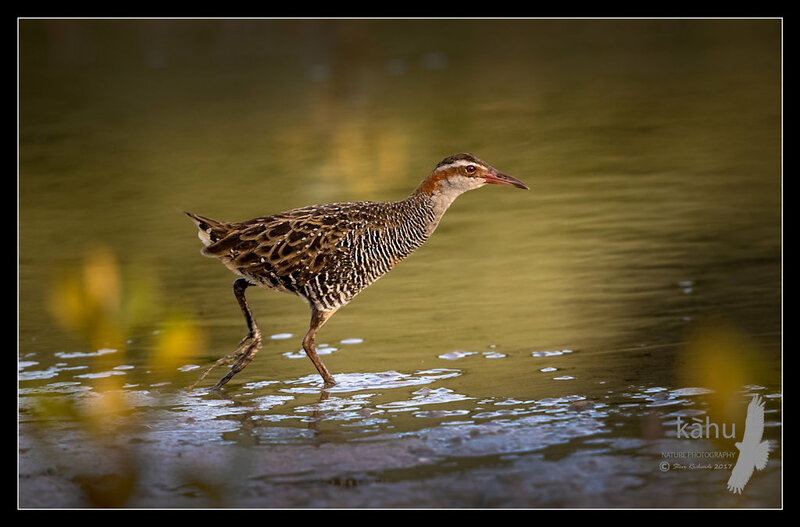 Suddenly a banded rail appeared near a pond so I got some good images. Suddenly a spotless crake darted out of the mangroves then back into cover. 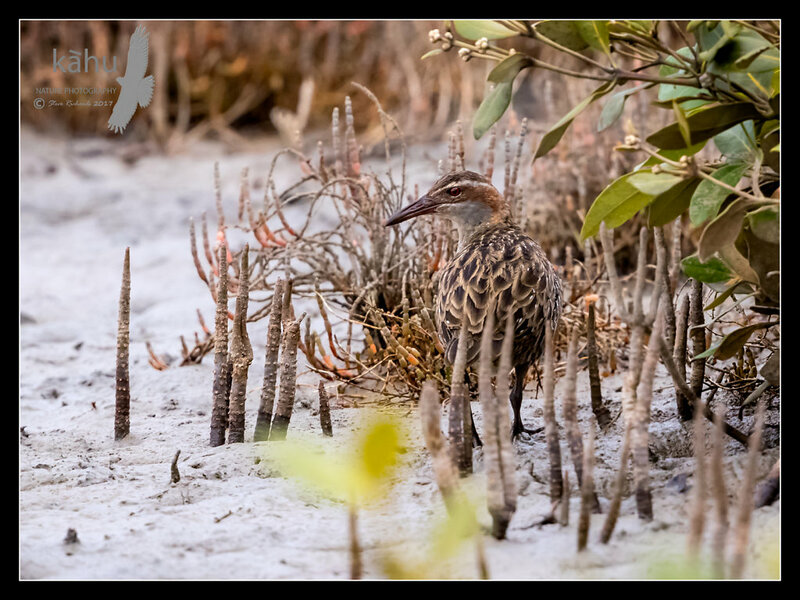 Over the next couple of days we got some very good images of banded rail. Mike Ashbee and his partner Amber arrived and stayed at Donalds, and we were treated to a scrumptous barbeque kindly put on by Donald and his partner Vern one evening. 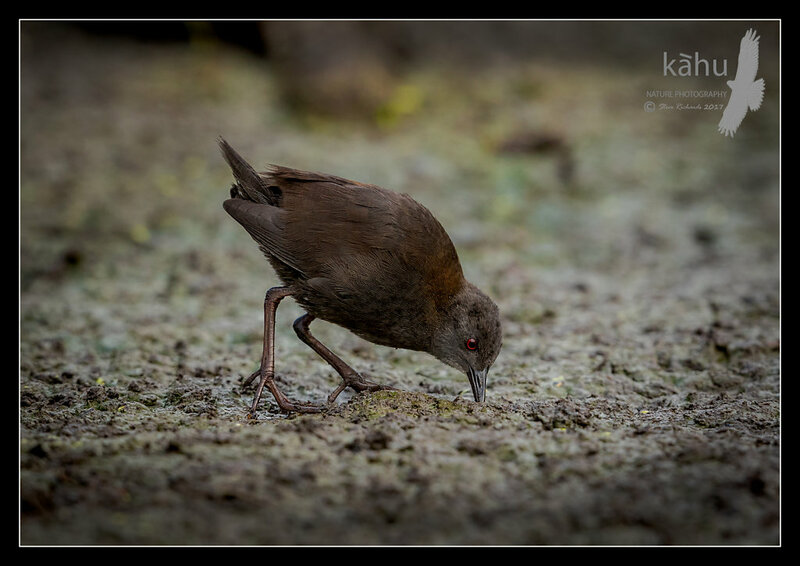 On the last morning I managed to photograph a spotless crake at Shakespear so I wasn't seeing things. Thank you Donald and Vern for you fantastic hospitality, and great company, and showing us around your patch. It was greatly appreciated. Next it was back to Whangamarino swamp to photograph spotless cake. We stopped at Miranda and camped there and visited the hides. Unfortunately my car was broken into, smashing two windows and stealing about $25,000 worth of camera gear. Fortunately we had our 1DX's and big lenses with us, but it was still a gutting experience. 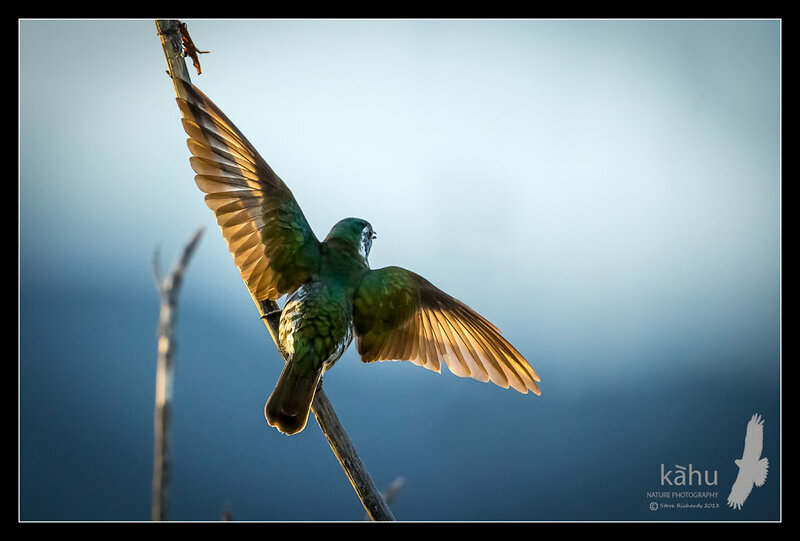 Being close to New Years eve we decided to head back to Upper Hutt the next morning, where I would get my car fixed and we would head back up to Pureora to photograph long tailed cuckoos. Next morning found us at Whangamarino. After several hours wandering around we decided to head back to the 4WD, hoping nobody had stolen anymore gear from the unsecured vehicle. Nearly at the 4WD I said to Tony lets have one last look down a side track. He said no, he had, had enough and wondered off. I when down the side track and played my crake call. Much to my surprise a spotless crake appeared a few metres away. 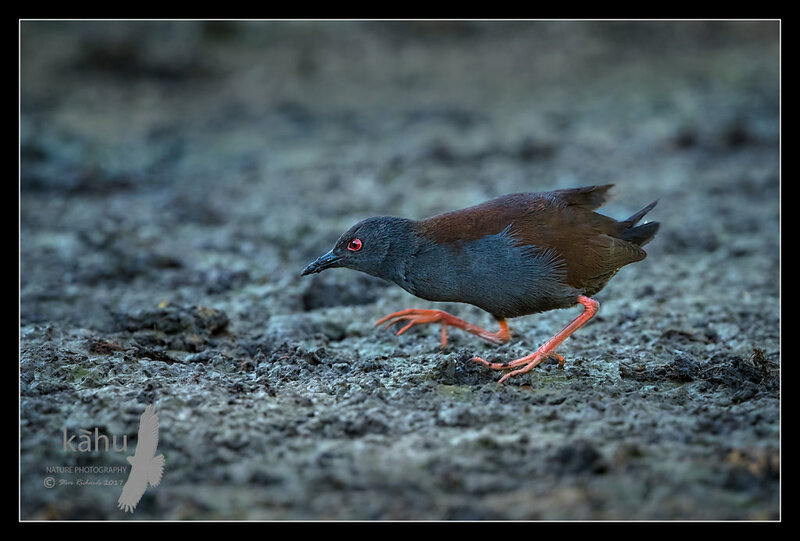 I knew instantly I had my best crake shots. Getting back to the 4WD I couldn't contain my excitement. Showing Tony, I said, you want to go back to see if we can find him? I should not have asked and a few minutes later we were sneaking up to the crake spot. I played the call and he appeared briefly, enough for Tony to get a shot. We headed off home, some what happier boys! 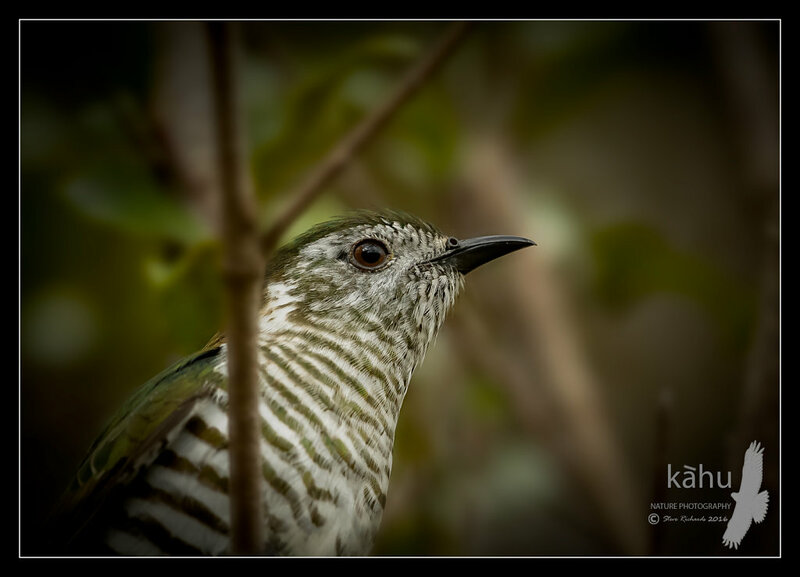 In December 2014, I had photographed a couple of shining cuckoos in Upper Hutt. I revisited the area numerous times but had only seen a cuckoo there on one occasion. My mate Tony, had been talking to Robert Brown who mentioned he had heard some shining cuckoos calling near his house. So we visited Robert for a brew, and he took us to a nearby bush area to try our luck. We immediately heard a bird calling and soon had several in the trees around us. We managed a few shots, but went back a few days later when the light was better. 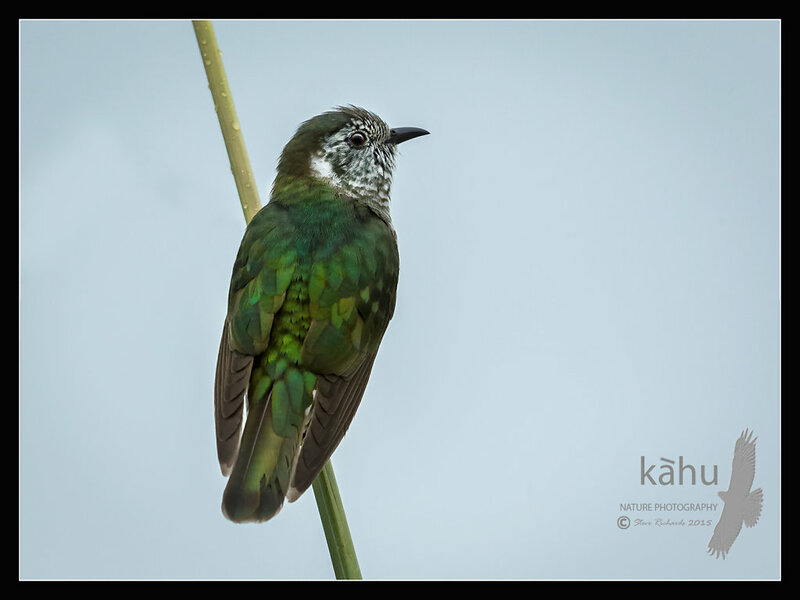 We found a cuckoo at another place and got great shots in much better light. The flower broom provided a beautiful background for several images. 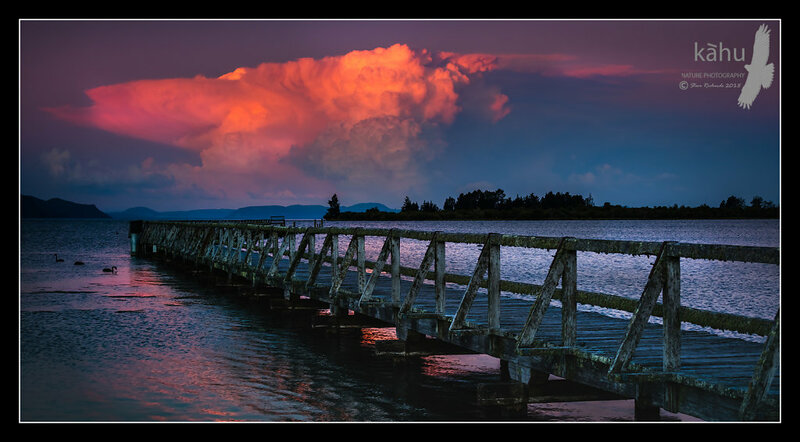 With the weather looking more settled after a few weeks of changeable weather I decided to go to Lake Taupo for the weekend. It would give me a chance to visit a couple of spots that I hadn't checked out during the winter months, and also use the new wildlife camera. Tony and I headed off at lunchtime on Friday so we could have an evening at Tokaanu to look for Australasian bittern and spotless crake. 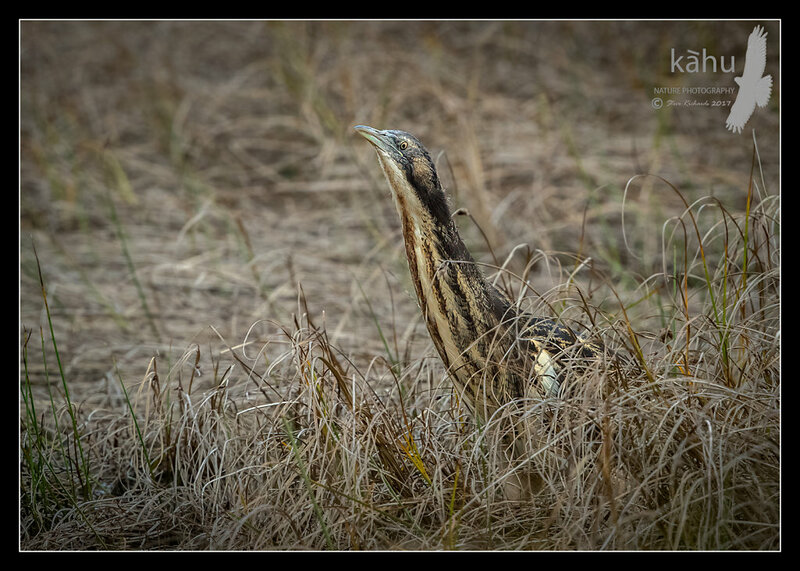 The first evening we saw 2 bitterns at the Old wharf, managed a few flying away photos but nothing special. Next morning we visited the old wharf, seeing another bittern and Tony saw a spotless crake as it flew away from under his feet. 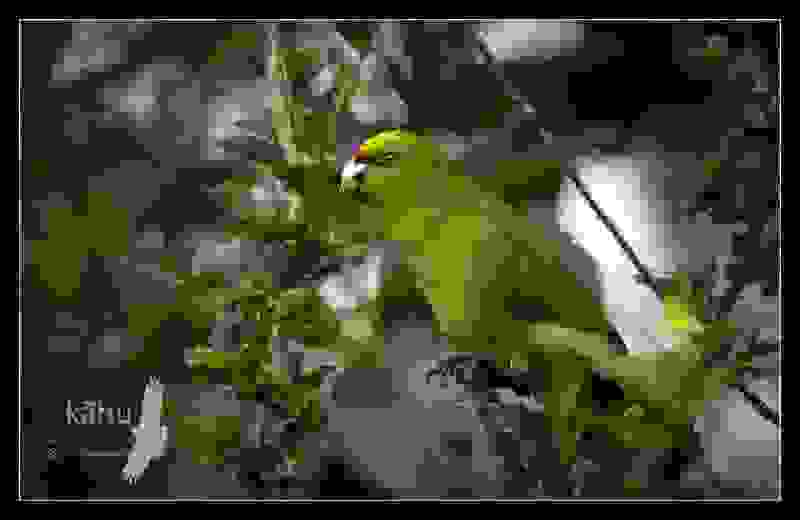 We managed to photographed a friendly fernbird. We headed over to Pureora, to look for the Yellow crowned kakariki, and kokako. 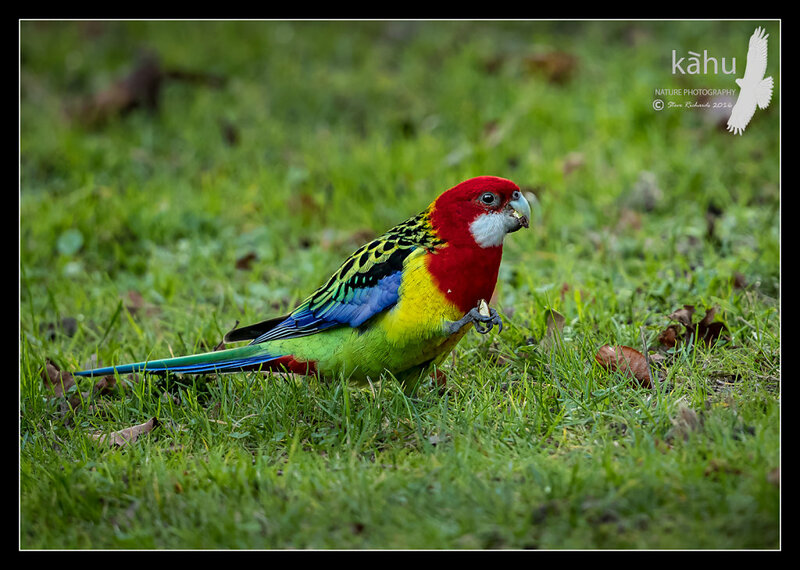 We visited the old haunts and saw quite a few kakariki, but nothing was withing range. Back at Tokaanu we photographed some coots chasing each other around, but there were not a lot of birds around. Next morning it was a bit frosty, but we had beaten the Aussies 42-8 the night before so we were feeling good. Off to the Old wharf road again and Tony spotted a bittern as we drove along. Lucky for me it was my side of the vehicle. It was in the reeds but I managed several shots before it took to the air. 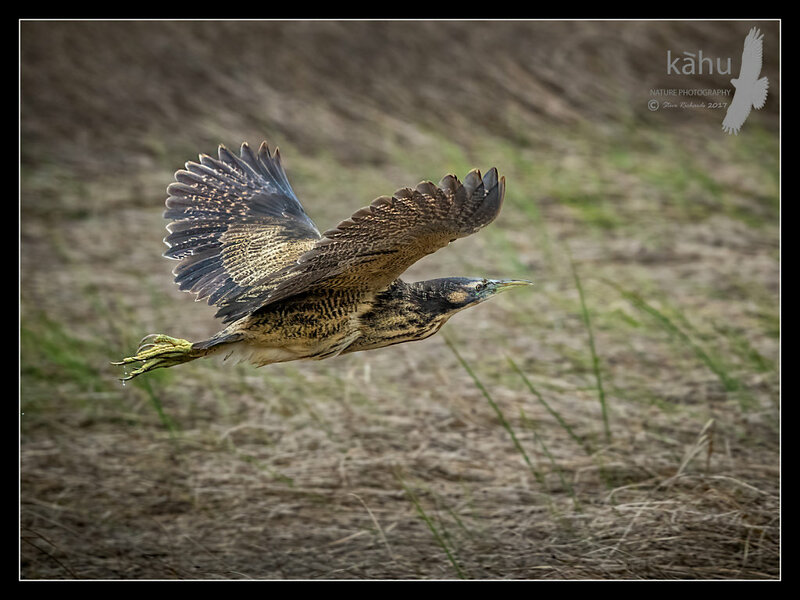 We headed of and saw another bittern flying over us and headed towards were it had landed. Tony spotted and another spotless crake on another set of ponds. We headed home after a very successful trip. The layout of the Canon EOS 1DX Mark II is pretty much exactly the same as the 1DX, so the change to the new camera was seamless. After micro-adjusting the AF on a couple of lens combos, and setting up the menus and cases how I had fine tuned the 1DX over the previous 4 years, it was ready to go. To test the camera I was going to several local spots over the next couple of weekends. In May I went on a pelagic photography trip into Cook Strait on the Seafarer II . It was organised by Michael Szabo in conjunction with members of OSNZ Wellington. It was very successful and we recorded 29 species on the 6 hour trip including 8 albatross species (Gibsons, Northern Royal, Southern Royal, White-capped, Salvin's, Buller's, Black-browed, Tasmainian Shy), 4 shearwater species (Short-tailed, Buller's, Sooty, Fluttering), 3 petrel species (Westland, Cape, Common Diving), Little Penguin, Fairy Prion, Australasian Gannet, Arctic Skua plus a few other common species. 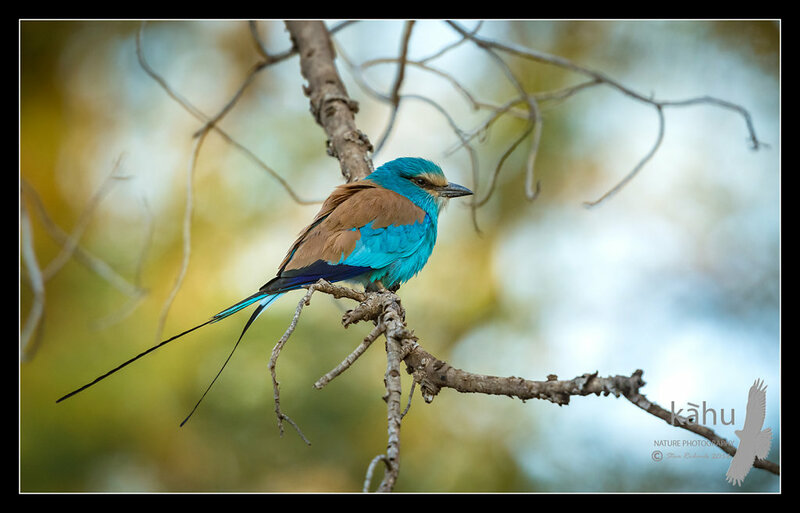 In January I went to Ethiopia on a birding tour with Rockjumper Worldwide Birding Tours. I had a fantastic time and took over 10,000 images. It was pretty over whelming, seeing just under 500 species on the trip, including about 100 species on the first day. I am slowly processing them and have been putting some up on the website. This is a long term project, so I hope to get much more of it done over winter. 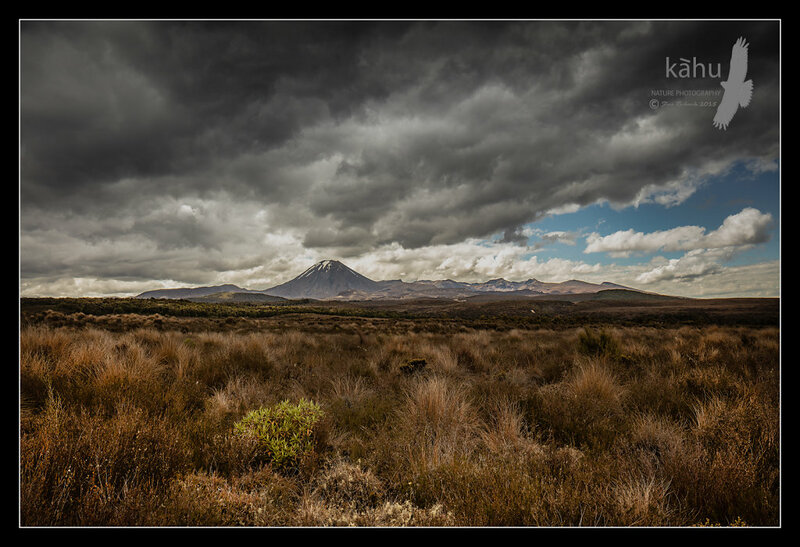 Over Christmas, Tony Fluerty and I, did a trip for a few days up to the Lake Taupo area. We were targeting Long Tailed Cuckoos and Yellow Fronted Kakariki in the Pureora Forest. On the way we stopped on the Desert Road and under stormy clouds, took some landscape photos of the mountains. 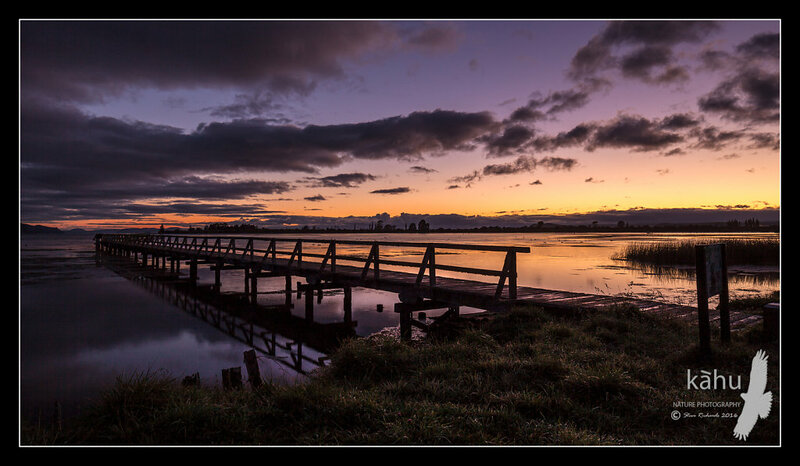 We stayed at Turangi for a couple of days and had beautiful sunsets and sunrises looking over the lake. 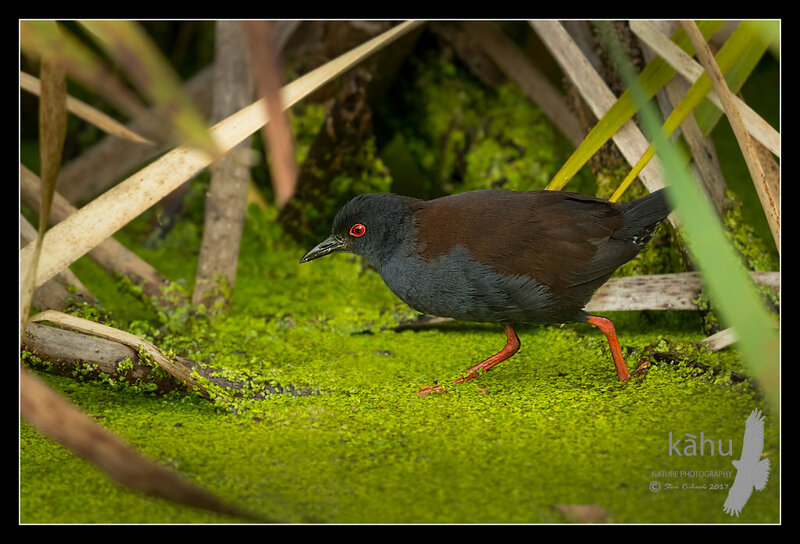 We visited our most successful spotless crake spot several times, but we only heard them but never managed to sight any. We managed to get images of swallows feeding their young and also a quail with a about half a dozen new hatched chicks. 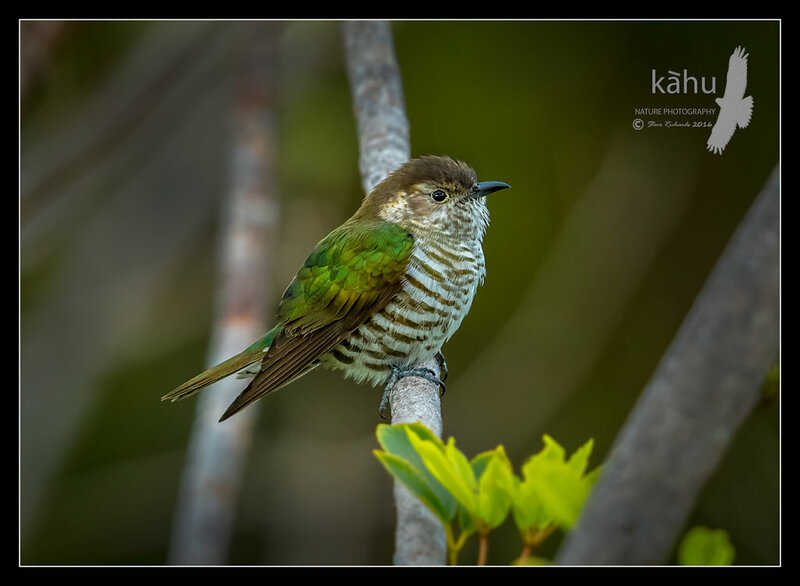 We did get some great photos of a couple of Shining Cuckoos and some fernbirds. 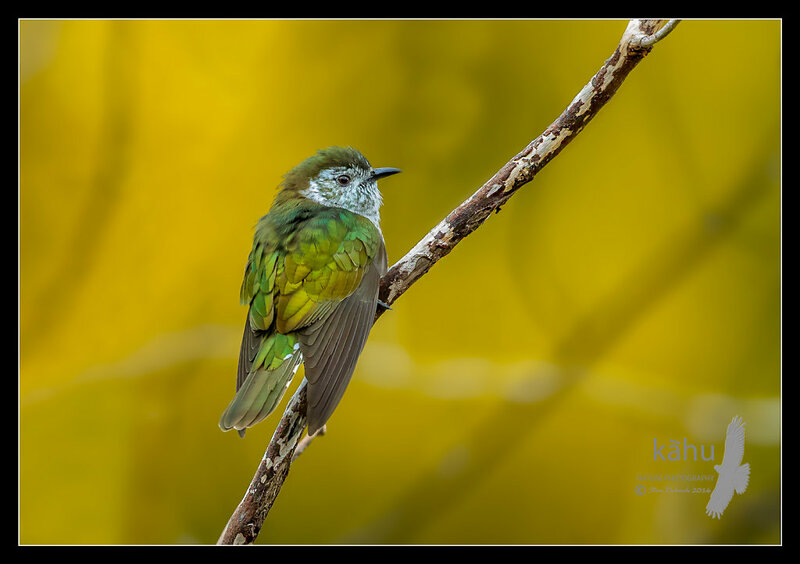 Over in Pureora we had very good success finding and photographing long tailed cuckoos and some yellow crowned kakarikis. We spent quite a bit of time looking for kokako, but never sighted one. We visited where we had got shots of one the previous year, but with no luck. We were not sure if the bird had died or had moved to another territory. In late 2015 we heard from local birders, there was a Terek Sandpiper at Foxton. So the next weekend we were off to find it. When we arrived there was some photographers already glassing the bird. We knew Duncan Watson(Ledzep), and he introduced us to Michael Szabo and Paul Gibson, the author of the book - Birds New Zealand - A beautiful collection. I had purchased Paul's book on the trip I had done to the South Island a few years ago. I was doing a pelagic trip at Kaikoura, when I saw it in a shop. This book was my inspiration to improve my bird photography. That first day the Terek was with Red knots which are pretty nervous flighty birds, so getting close,the heat shimmer and a harrier regularly flying over stopped us getting good photos. In 2016 , when the Red Knots had headed off on their migration, the Terek Sandpiper remained and took up feeding and roosting with the Wrybils. Because the Wrybils are so confiding, it soon became possible to get close enough to get some great photos of the bird. 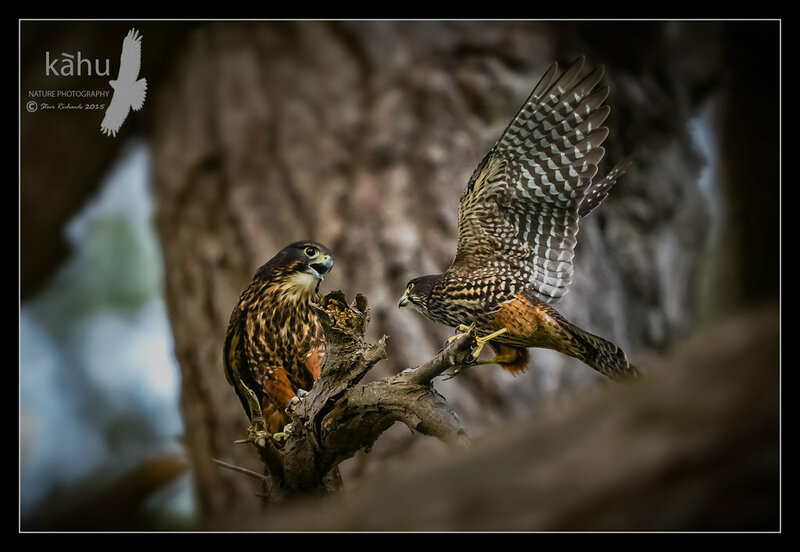 I had not had great success in photographing New Zealand Falcons. I have seen them in several parts of the country but unfortunately they were never ideal situations. 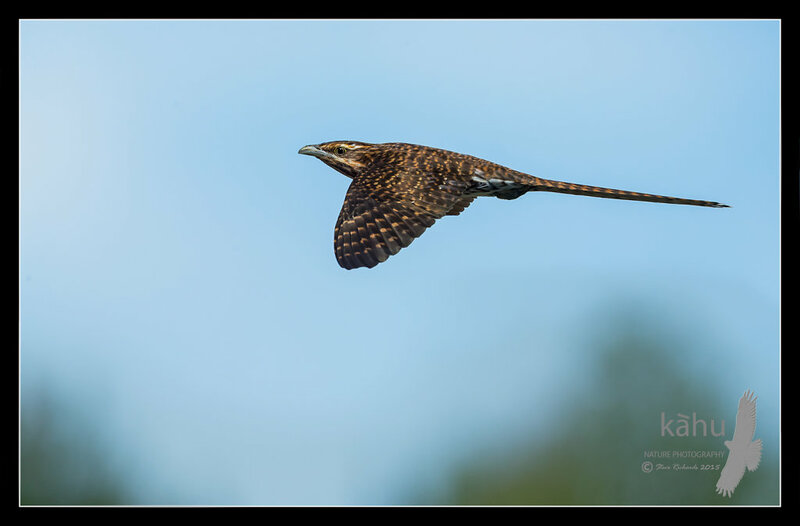 We have several living locally and I occasionally see them flying around Upper Hutt. When I read in the newspaper that a pair were nesting in the hills above Wellington City, my ears really pricked up. The next Saturday morning Tony and I went to scout out the location. We quickly found them when we were attacked by these aggressively protective birds. Backing off out of their attack range we planned a strategy to get the best photos. They were situated in the tall, very old, gnarly pine trees, which were quite close together, we would also be shooting up at quite an angle. So perched shots would not be easy, to get pleasing angles but the flying shots I wanted would be extremely difficult. So we would have to carefully plan future visits. Back in 2014, Tony and I started putting a lot of effort into photographing pheasants. They are in quite good numbers on the west coast from Paekakariki north, along the sandy coastal region. Hunters can shoot them during the hunting season, in the winter, so we needed to find a place where the hunters weren't allowed. Queen Elizabeth Park looked ideal, and Tony had seen a lot of pheasants and quail there in the past. 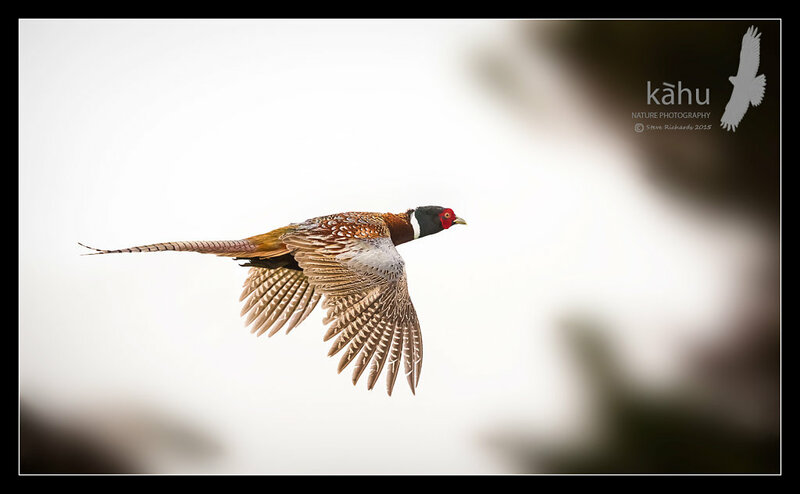 We got some stunning images of Californian Quail, which frequent the side of the road, but the pheasies were not quite so easy. 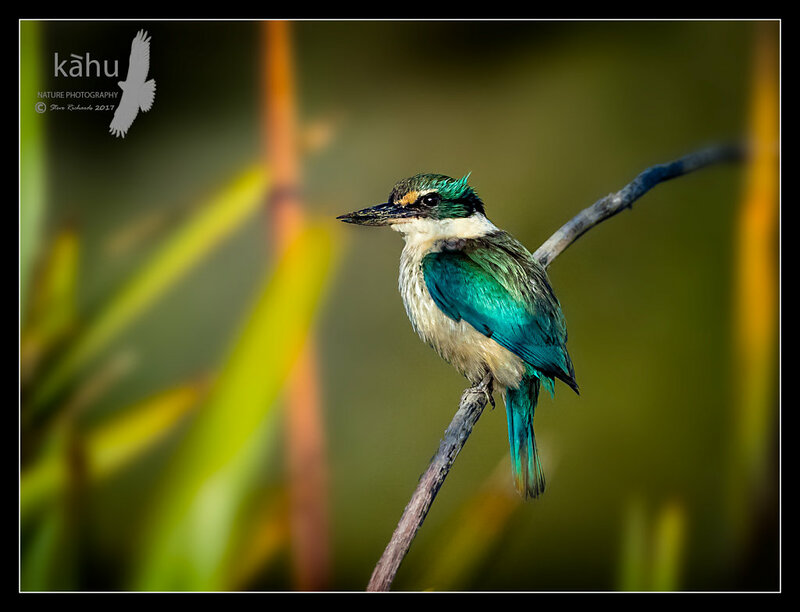 The breeding season in the spring is the time the males are most active, calling and displaying. 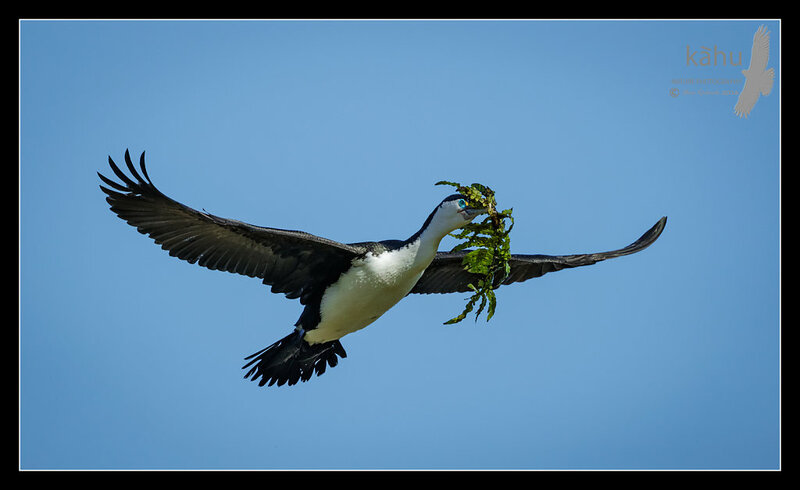 The first year we had got success and I got some nice flying images, but we wanted some of the birds displaying and male birds scrapping. We also never had a lot of luck photography the very shy, well camouflaged females. So in 2015 I did a lot more reconnaissance to find more birds. I finally got the chance to photograph a beautiful male displaying, and also we started seeing more females. We also had some good days up further up the coast towards Foxton. I was fortunate enough to get one of the first shipment of Canon EOS 5DSR to arrive in New Zealand. The 5DSR is 50 MP and will be my go to landscape camera. I will also be keen to try it with my super telephotos, as the extra megapixels will sure to give a huge amount of feather detail. My 1DX will still be my action camera, but I am keen to try the new camera. I haven't done much with the blog for a long time. But now I am going to be putting up regular posts. 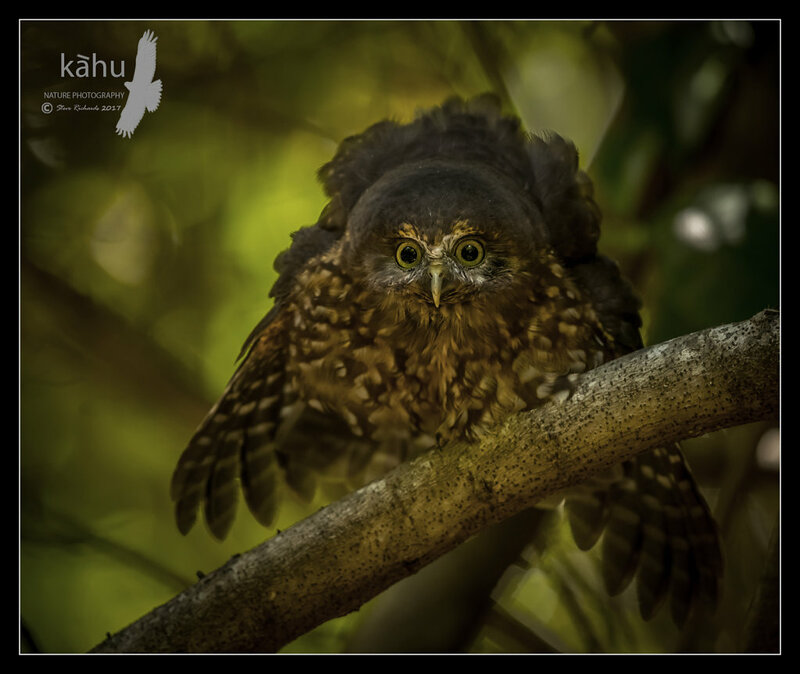 I have changed the site a bit and now have a Kahu Articles page. 2014 was a year when I didn't get as much photography done as I would have liked. I had to work in my business quite a lot as we had a few staff changes. Moving to the new building and getting everything set up, was a much bigger job than i had anticipated. But we are all go now! I have put some of my prints on display at DigitalDecor, the Large Format Digital printing company I own. We are at 4/24 Goodshed Road, Upper Hutt. 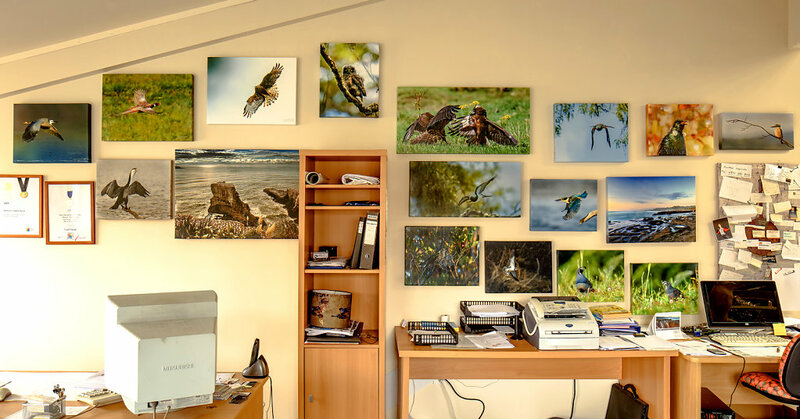 We can print images on most media, so if you want any of your favourite images printed onto canvas, fine art paper, perspex, ACM or fabric, give me call or come and see me. FINALLY ...... Yahoo! We have got our power and phone lines sorted at DigitalDecor. 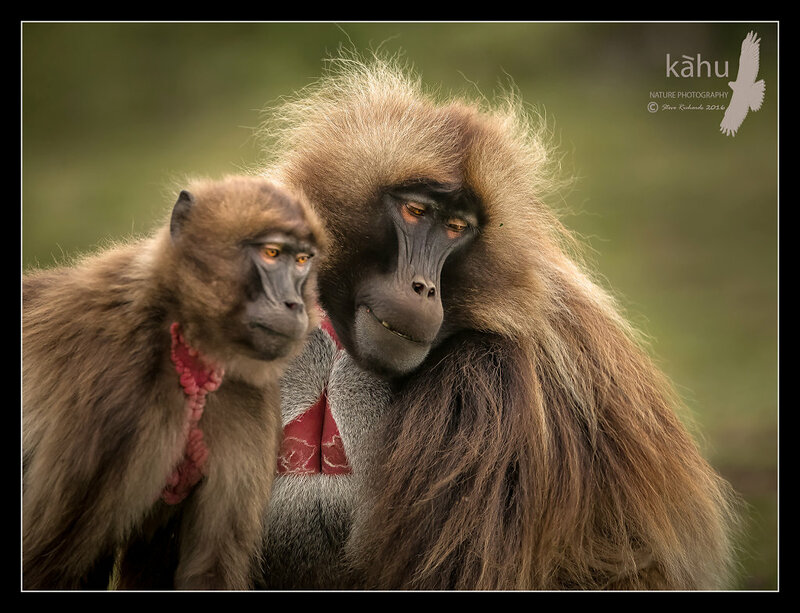 I can now get my camera gear dusted off and create some more images. I have managed to sneak out over the past month and get some photography done. 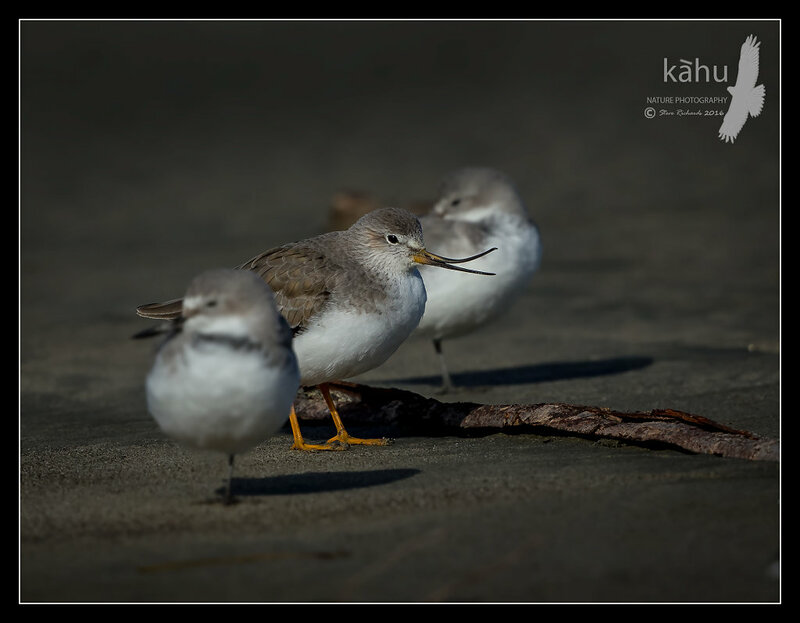 I managed to shoot some flying Banded Dotterels at the Waikanae River mouth. I was hoping to get them nesting, but it seems they have already nested. Got some great shots. Of note I also saw an Australian Bittern flying north over the estuary. I am planning a reconnaissance trip to Hawkes Bay for a few days. 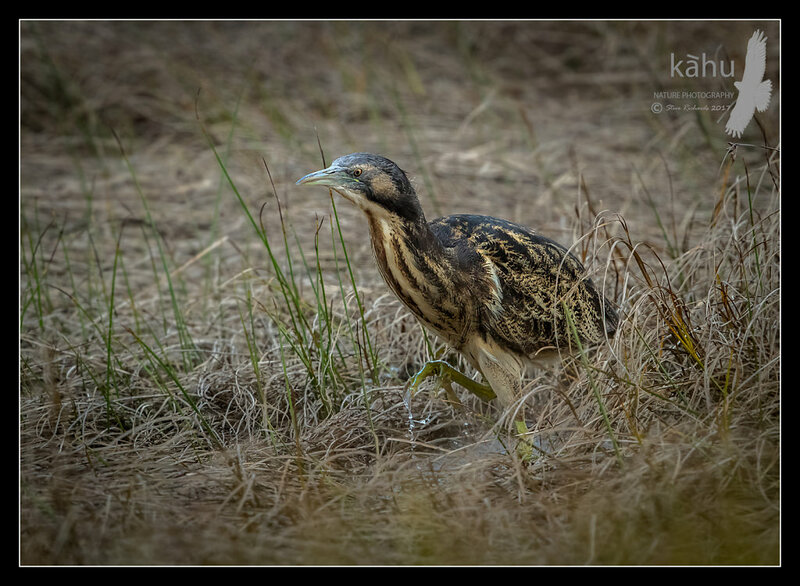 I want to try and locate then photograph Australasian bittern, spotless crake, tomtits and rifleman. I will go and have a look at mouth of the Ngaruroro River and Boundary Stream Mainland Island. FINALLY we are getting settled into our new premises. We managed to move everything without breaking anything important. It proved to be a huge task, and something I will never do again, hopefully. It didn't take long to fill the 6000 square feet. All our printers are up and running and the heat presses wired and ready to start up..... as soon as we get the 100 KVA cable we had to have put in, connected to the mains out on the street. It is frustrating as we can only run one heat press at a time, with the temporary power set up. I haven't had a camera in my hands for months, but hope to get out in the next few weeks. 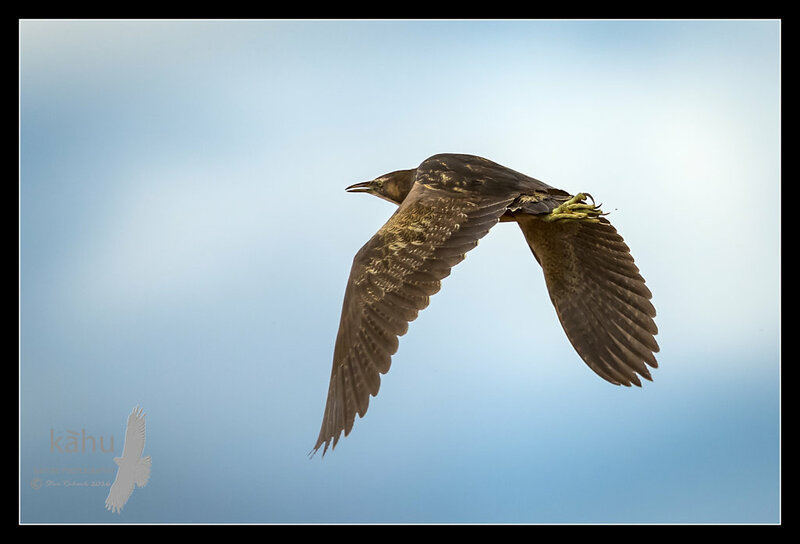 I have started processing and loading some more of my photos onto to site, some are in the NEW IMAGES birds gallery. I have about 40,000 images to sort, then process the few chosen and upload them to my site. I use Lightroom to store and process my raw images, then I do a final process in Photoshop and the they are ready to upload to my site. FINALLY .... 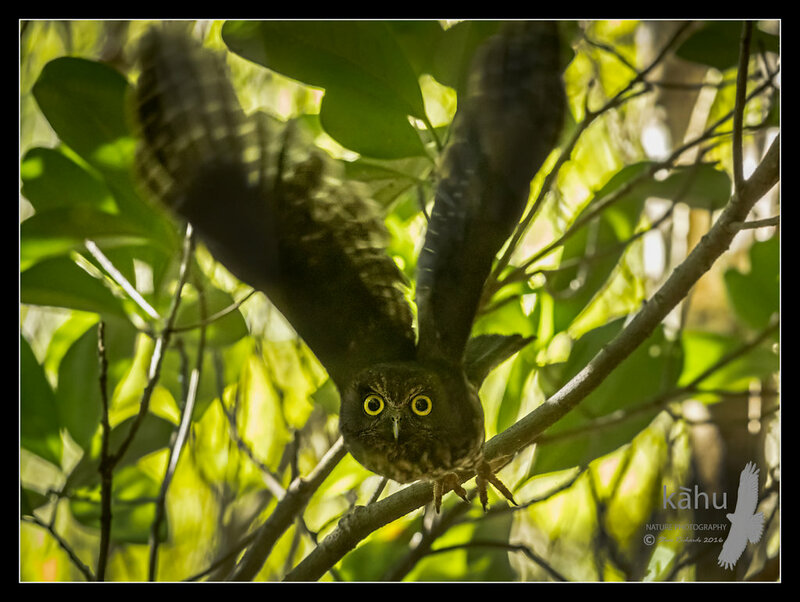 I have got the beginnings of my Kahu Nature Photography website uploaded to the web. Phew! It has taken a while to get it together, and the work doesn't stop there, it's still a work in progress. 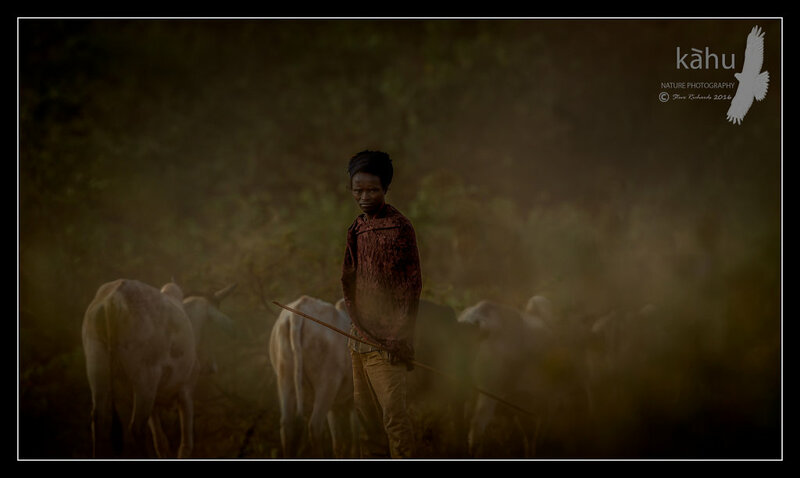 I intend to continue to develop it and load a lot more of my images, taken over the past few years. The Workshops will be loaded in the near future. The workshops will be about improving your photography and computer skills. To get the best out of your digital photography you not only have to know how to use your gear quickly and properly, but you need to be able to develop your raw files to there full potential. For those that have Canon gear, I have a selection of Canon lenses and several camera bodies which will be available for attendees to try out. At the moment I am in the process of moving my DigitalDecor business. We are moving to a larger more suitable building. We have been in our current building for over 20 years, and my business has changed so our requirements for space have changed. We have a lot a of big heavy equipment, so once I got my head around moving, I just can't wait to get to the new premises. We have to be out of our present premises by the end of August, and I have been moving gear for the last couple of months. Boy, do you get a lot of stuff over 20 years, so it has been about every fifth load to the rubbish dump. Once we are set up, our graphics studio will be used in conjunction with the workshops.